Back in the day, you’d buy meat from a butcher, veggies from a grocer, and maybe swing by a dry goods store on your way home. Grocery shopping was a multi-stop affair. Now, you visit a local supermarket or a big-box retailer that has everything you need in one place. A similar change is taking place in how people consume content. Before, we relied exclusively on a collection of blogs and websites to provide us with the content we wanted and needed. Brands then entered the game, but the model didn’t change much: They just produced their own content, instead of relying on publications to write about them. Now, something else is happening. In a world of nearly infinite content, consumers are looking to one-stop shop. Platforms are retooling or being created to serve those needs. And that has powerful implications for content marketers. The age of big-box content retailers? Facebook made algorithm changes that gutted brand reach in favor of “high quality” content. The company’s Paper app aims to be a one-stop destination for curated content. LinkedIn started an influencer program that delivers high-quality content from people you trust. And, it just opened this publishing platform up to everyone, adding a new twist to the platform-as-curator idea. Startups are working on it, too. Tools like Nuzzel aim to curate your Twitter or Facebook feed, and Flipboard allows you to create your own personal magazine cribbed from sources across the internet. We’re starting to consume content like we grocery shop. Instead of visiting a collection of blogs, media properties or brands to find what we need, we increasingly find carefully curated content in just a handful of places. Few platforms better showcase these changes — and the challenges they pose to content marketers — than Medium, a social publishing platform created by Twitter co-founders Evan Williams and Biz Stone. By understanding what Medium is, how it works, and why it matters, content marketers can gain some insight into what’s coming next — and how to prepare for it. There’s disagreement over what Medium actually is. Slate called it a content management system, but has since reconsidered. Anil Dash calls it “the YouTube of blogging,” where consumers “graze through the site,” and also refers to it as a sort of crowd-sourced magazine. 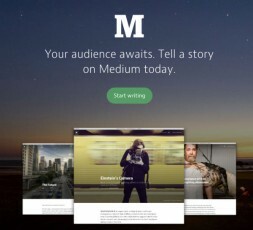 Medium’s founders call it a place to start finding interesting content. Medium’s recommendation rating system echoes Reddit‘s front page. And the site’s algorithms and human curators bring to mind some of the content discovery tools out there. At it’s most basic, Medium is a way to publish stories. While Williams’ previous company, Blogger, let you own those stories at a unique URL, Medium’s stories all live on the same site. Stories are organized into Collections, which are created both by Medium and by its users. Posts do not display a publishing date or time and, unlike many blogs, are not organized by publish date, either. Instead, consumers follow Collections to populate their reading lists with material. When users find a post they like, they would then click “Recommend.” This action influences the story’s visibility both within Collections and on Medium’s Top 100 list — a central catalog of the month’s best content, as determined by Medium’s algorithms and editors. To create blog content on Medium yourself, click “New Story” and start writing directly into the platform’s minimalist text editor. Technically, you could also easily copy an existing post into Medium’s text editor and republish it (though in doing this, you may risk running afoul of Google’s duplicate content rules, depending on the type of content you’re putting out there). It’s both an evolution of and a departure from blogging — and one that’s attracted attention. Medium secured a $25 million investment round led by Silicon Valley venture capital firm Greylock Partners, and participation from Google Ventures, Tim O’Reilly, and Gary Vaynerchuk. So, why does Medium matter? Medium is a platform that content marketers should definitely investigate, with interesting potential and useful metrics on how many people actually read our content. But, more importantly, Medium provides a glimpse of how content is likely to be created and consumed in the future. How will your company stand out in a world where content delivery is increasingly contextualized and filtered? Quality content will continue to attract qualified prospects, build your business, and increase your marketing ROI. But it’s no longer just about hosting content on your site and amplifying it via social. It’s about vying with all the other shiny brands, publishers, and independent voices — on the same shelf. Instead of coming into your store, prospects are going to big-box content retailers, where everyone is displayed. What happens when, instead of using these platforms to drive traffic back to owned media, the platforms become the primary place where content is consumed? How are you going to catch their eye? How do you make your voice heard when someone else owns the megaphone — and decides when to turn it off and on? Brand storytelling will matter more than ever: Utilitarian content will always provide value to prospects and customers. But brands are going to need storytellers-in-residence who can inspire, entertain, invoke feeling and provide downright amazing content to compete on these platforms. It’s time to start taking risks: New platforms — and new applications for existing ones — mean content marketers need to experiment, adapt, and push outside their comfort zones. We don’t have the luxury of owning our content anymore. Brands can’t hold back if they want to succeed. They’ll need to become more comfortable with taking a few knocks and falling down a couple of times while they learn the best ways to tell their stories in this new landscape. Long-form content and thought leadership are going to be your best friends: Product- and service-facing content that helps prospects evaluate and make purchasing decisions likely won’t go far on these platforms; longer-form content and thought leadership — with powerful human interest, cutting-edge insight, or in-depth analysis that consumers can’t get anywhere else — will. Have you used Medium? What do you think of the trends described here? How do you see content consumption changing? Mike Kaput is an inbound marketing consultant at PR 20/20, a Cleveland-based inbound marketing agency, where he also contributes to the PR 20/20 blog. Follow Mike on Twitter and contact him at mike@pr2020.com.